This module aims to help the future MPE in Diagnostic and Interventional Radiology (including imaging outside the D&IR department proper) acquire the knowledge, skills, competences and attitudes necessary to exercise a strategic leadership role within the profession in own country and in Europe both in terms of professional issues faced by the profession and own personal development as a leader. The content of the module will provide a framework for discussions for all the other modules. In the onsite phase participants will have the opportunity to interact with and discuss issues facing the profession and personal development directly with European leaders. The participants would also be updated with the latest EU directives, guidelines and policy statements impacting the role to ensure they are at the forefront of these developments. The module will achieve its learning objectives using a combination of online and onsite readings, fora, presentations and case studies. The online component will consist of sets of compulsory readings. Each set of readings will be accompanied by an online forum for difficulties and real world case studies to promote reflection on their own attitudes towards leadership and discussion in preparation for the assessment. The online phase will be asynchronous so that participants would not need to take time off their clinical duties and there will not be a problem with time zones. Module participants can put forward the issues they are facing in their own country and receive feedback and advice. As preparation for the assessment, further case studies will be discussed with the panel. Onsite presentations will be sent to the participants 2 weeks before the start of the onsite phase. Food & drinks (coffee breaks) Participants will be offered optional 6 coffee breaks + 3 light lunches for a total of € 60.00 Euro (optional). Participants can bring their own sandwiches. 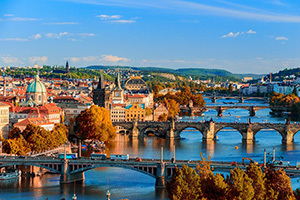 Lodging of participants Prague is full of accommodation opportunities but participants will also be offered low cost accommodation at the faculty hostel (about € 25.00 per night). Transport Airport bus to centre of Prague € 1.00. Facultative visits to companies, hospitals, musea, guided tour of the city, social events Optional social events: guided walking tour of Prague (free), Black light theatre( about € 20.00), Dinner at traditional Czech pub (about € 20.00). Cost for conference dinner Conference dinner is optional social activity.